The High Fidelity 3100 has crystal clear quality with a improved digitizing method of law, unlike any other in the industry. Messages are recorded from the built in tape player and stored on digital memory. Storing messages digitally limits mechanical breakdowns you would have with other analog equipment. The unit stores audio in µlaw format which has an equivalent bit rate of 112 kbps. The new tone control gives you a broader range of sound, thus allowing the bass and treble to maximize the 3100's fidelity. 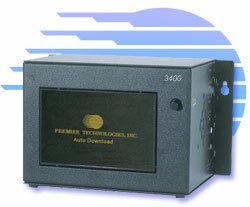 To guarantee a perfect download, our system uses the highest quality tape drive in the industry. The drive is built to accompany high end stereo equipment, not the lower quality tape drives found in answering machines. The unit loads your customized on hold program on speed every time. A technological breakthrough gives the HiFi 3100 the memory of the future. The nonvolatile memory assures the recording will never be lost due to loss of power. The HiFi 3100 is compatible with any telephone system that has a music-on-hold interface. The HiFi 3100 is easy to operate and install. A human voice leads you through product installation and production download.